How Do You Handle Potty Training While Out? When you're out and about, chances are, your child will have to use the potty at some point. You don't want the progress you've been making in potty training to be hampered, but you know it will take some extra effort. Potty training on the go is a little bit like being a Boy Scout. No matter what your method, you've got to be prepared. Try to get your child to use the bathroom before setting out on your trip, and make sure you've got everything you could possibly need before heading out the door. More clothes are better than fewer, and never leave the wipes at home. Here's how you can be prepared for different situations. Most important of all, don't forget to exercise the same patience while out with your child that you do when potty training at home. When shopping, some children are afraid of using the big potty. It's loud in there, the toilet is large, the flusher is loud—who can blame him? You can help by bringing along a seat that fits in the regular toilet. This can be large and cumbersome, but since the diaper bag isn't full of a lot of diaper paraphernalia anymore, chances are you can find a seat that will work. If you're not up for that, then try kneeling beside your child while they are sitting and hold their hand or their body if they seem scared about slipping in. Another thing to try—sit as far back on the toilet yourself and then put your child in front of you. 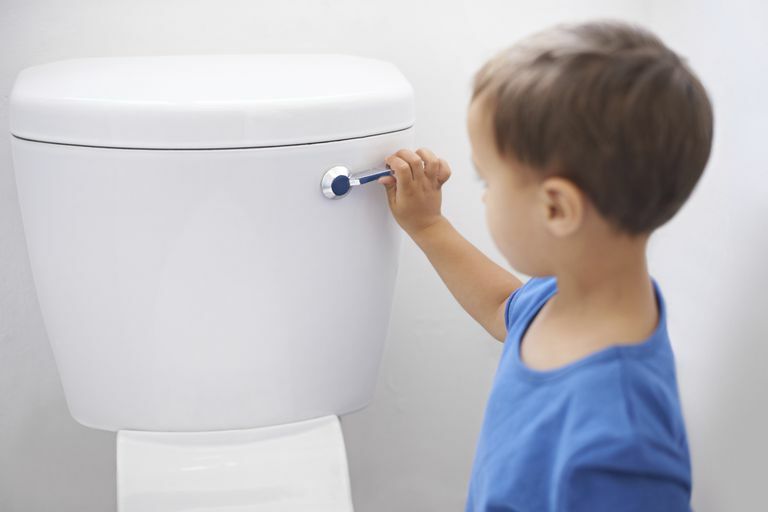 You never know when potty emergencies while shopping may actually work to your advantage. If your child loves a toy store, he may be reluctant to leave rather than giving in and using the public restroom. This can be a breakthrough for using the potty. When visiting friends, you've got a little more flexibility. You can bring a potty chair along, as well as any dolls and books your child might enjoy while going to the bathroom. Just make sure you outfit your child with plastic pants or perhaps even use pull-ups if you have a friend who is uncomfortable with accidents on new furniture or floors. Make sure to explain to your hosts how you handle accidents and ask that they try to maintain a positive atmosphere for your child. Ask about any special bathroom issues. Is the toilet very loud? Is the toilet paper hard to reach from the toilet? Is the light easily accessible? Does the toilet have any problems flushing? There are some great potty chairs available for road trips. There's an inflatable potty (Inflate-a-Potty) that uses regular trash bags for liners. You can pull over and go right there if you're not close to a gas station or rest stop. These chairs are inexpensive enough to equip every vehicle you own. Make sure you've got changes of clothing and wipes around just in case. The inflatable potty will certainly work for these situations, and there's also a chair that folds up like a suitcase that your child can carry himself if you're already carrying a load of stuff around.